January 2005 – Ben Boyle lives here! 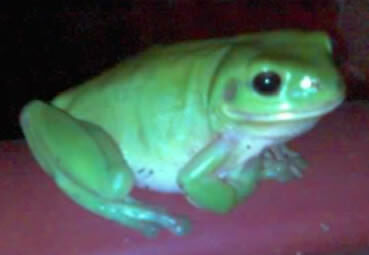 As suggested by Inspiral, here is some froggy goodness. We came home on Saturday night to find this fellow sitting on our railing. Makes a nice change—normally we only find toads. It’s been a while since I posted something geeky—or anything really. Remiss of me really, to not post that I have a new phone: a Motorola E398. I decided to forego the bells and whistles, as my previous phone was very expensive and they haven’t really integrated all the features I want into a single phone (yet). So, no bells and whistles. Just stereo speakers and rhythm lights. Just a 64MB memory card—smaller than a SIM card—to hold 14 MP3s (I could only fit 4 on my old phone!). Seriously, the E398 was free on a $25/month plan at Optus and it’s a great phone for that price! So send me an SMS, set off the MP3s and flashing lights. You know you wanna! Maybe I could throw away my expensive phone and get an ipod shuffle instead! Posted on 12 January 2005 Categories Uncategorized2 Comments on Ooh, cheap ipods!